The Ultralight kites will be produced on request only, please contact us to order and we can give an estimation for delivery time. The Ozone Chrono V3 is also available in an Ultra Light version. This is the same design produced with high quality lightweight materials to reduce weight and packing volume to a minimum. The Ultra Light offers true performance increases and enhanced flying characteristics. It inflates quicker, launches in lighter winds, flies faster, stays in the air longer in gusty conditions, and is more reactive even in the lightest breeze. The Ultra Light version is 25% lighter and packs down to around half the size! The technical backpack is the same design as the standard version using lighter materials. Born from the Chrono legacy and packed full of the latest technology, this allnew design takes it to the next level. The Chrono V3 is by far the most universal high level foil kite, you can expect outstanding performance across the board. We’ve radically improved the overall flying sensation, making the V3 more responsive and reactive giving the rider a more direct feel and confidence. We’ve focused on creating a progressive feeling in the bar throughout the depower throw range, keeping consistent control in light or high winds. The handling has an impeccably smooth turning motion and the kite has nice drive following through the turn, which means the V3 can easily be looped. The kite is more reactive due to being a stiffer wing, which means it’s incredibly efficient even in the lightest breeze. 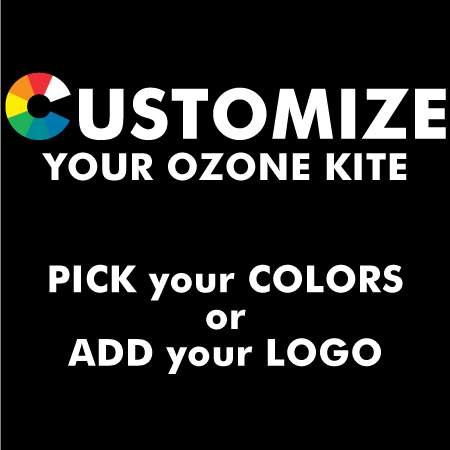 With the Chrono V3 upwind riding has become a "no brainer" and this kite will get you out in winds you previously thought were unkiteable. Stability is essential no matter what conditions you’re out in, we’ve made sure the V3 holds its ground and delivers the utmost rock-solid stability. 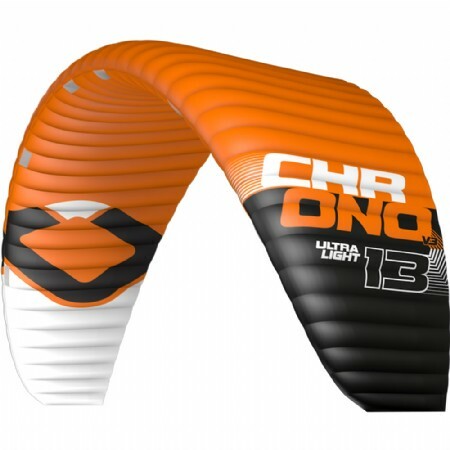 The Chrono V3 is designed to deliver, for the competent kiter aspiring to ride an enhanced performance kite, which is powerful yet at the same time forgiving and not demanding. Get ready to experience heightened sensations that will give you the confidence to take your riding skills to a whole new level! The Chrono V3 is water re-launchable, but we recommend that you keep it flying and out of the water if possible! A drainage system on the wing tip allows any water that may have entered the kite to drain out. Do not use the kite in waves. The Chrono V3 features a simple yet effective front line flag out release. After releasing the flag out check the speed system, bridle lines and flying lines for twists before restart. 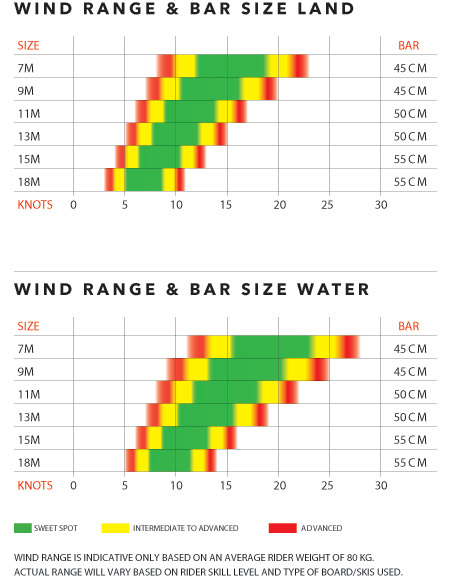 Speed System and Bridle lines should be regularly checked and maintained in the correct trim or the kite will not perform as designed. If they are worn or not to factory specification (+ or - 15mm) they must be replaced. 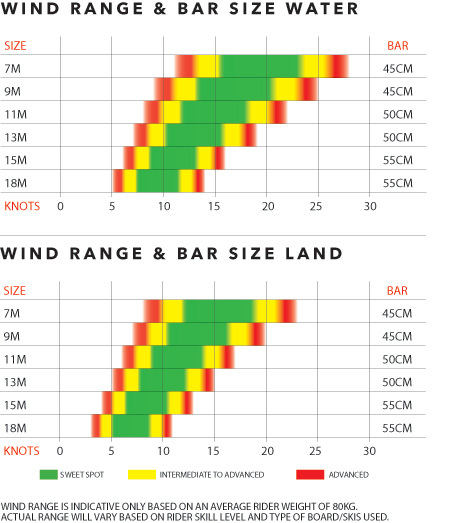 High Performance Materials – High-tenacity sailcloth with extremely low porosity values and an overall lightweight. Performance Double Surface – The Chrono V3 has a lightweight double surface design that is mid-high aspect ratio and combines 38 to 44 cells depending on the size selection. The high number of cells means the ribs are positioned closer together, producing an ultra smooth surface. This corresponds to reduced drag and a clean profile, resulting in superior flight efficiency. Leading Edge Profile Reinforcements – The Leading Edge is reinforced with flexible lightweight plastic battens to maintain the shape of the profile during angle of attack changes and turbulent airflow. This drastically improves overall performance as the foil remains true to the designed shape. Internal Diagonals and Straps – Internal span-wise straps work in unison with optimized diagonal ribs, distributing load from the bridles evenly and effectively. This increases the internal structural balance, while allowing the top and bottom surfaces to maintain the designed profile without being distorted from indirect tension or loads. Optimized Leading Edge Air Intakes – Precisely positioned intake valves along the Leading Edge lead to a stability increase at all angles of attack. 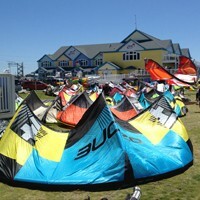 The inflation is easy and safe as the kite rapidly inflates. Sheathed Dyneema Bridle Lines – High quality, low stretch sheathed Dyneema bridle lines for maximum strength and performance. This is the same bridle line we have used on our snowkite range for the past 10 years. Double Pulley Speed System – Using high spec low friction Ronstan Orbit pulleys to reduce wear and rider fatigue while improve feeling and performance of the kite.